It’s amazing that the lead singer from Hootie & The Blowfish became a huge country star nearly 15 years after his band struck it big in the pop world. Darius Rucker came out strong with 3 number one hits on the country charts starting in 2008 and added a fourth top three single in 2009. 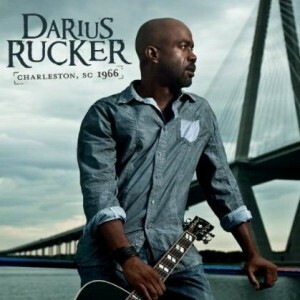 Now Darius is back with the much anticipated follow-up album Charleston, SC 1966 . This one follows his country debut Learn To Live , which sold well over a million copies. The sales don’t quite match the 10 million plus that Cracked Rear View sold back in the ’90s, but it’s quite a feat in today’s world of free music. The new album is full of great music. Once again Darius has co-written all of the tracks on the album. It’s great to see him putting out great music well into his forties. He defied all the odds and made his own way in country music. It’s great to see him making the music he loves and connecting with the great country fans. I thought I’d have a listen and give you some insight into each song. That way you can decide if the entire album is for you or if you only want a few tracks. The album gets off to a rocking upbeat start with the opening track This. There is nothing else to expect from Darius. He seems to content with his life and how things ended up…and that’s what the song is about. Everything that has happened in Darius’ life – good and bad – has led him to where he is today. And that’s a pretty good place seeing he’s now a big country star. The melody is catchy and catchy music seems to be turning into Darius’ trademark. He puts out songs with choruses you can’t help singing along with. The topic is nothing new, but Darius has the ability to put some different spins on common issues. This is a good one. Everybody should recognize this track since it was the opening single and is nearly at the top spot on the country charts. While the song sounds positive and upbeat the lyrics are of man pleading for redemption from the women he wronged. When things don’t work out we all feel the pull to get back to the way things were. We all screw up and need to beg for forgiveness once and a awhile. Come Back Song is a unique way of begging for a little understanding. It’s a great track that everybody in the country world is now familiar with and for good reason. I can see this tune being played on radio for many years. Country fans with kids will definitely relate to this song. When the little ones are running around and you and your spouse are both working all day long there isn’t much time left for being intimate. The song continues the upbeat feel and as Darius finds a way to squeeze in a little time for him and his wife between being on the road and tucking the kids into bed. You have to treat those women right during the day so when nighttime comes there is hope for getting lucky. The song reminds me a bit of Phil Vassar’s Just Another Day In Paradise, but only because they share the same topic. Might Get Lucky is original in sound and performance and it’s a great little track on this album. On track four Darius slows things down for the first time. The track is about the power both whiskey and a woman can have over a man. For some reason they both have a crazy pull over men and can make them go crazy. Whiskey gives the narrator a little bit of strength – if false strength – to get through life without the one he loves. There is some steel guitar in this track to make things a little more country. It’s reminds me of some classic ’90s country. It’s a good track that might find some fans out there in the lonely world of country music. There is desperation and hope in the voice of Darius towards the end of the song that listeners can really feel. The beat kicks back up to mid-tempo on this track. You knew Darius couldn’t keep things down in the dumps for long. The song is all about the things Darius misses about his hometown South land when he’s out traveling the world. The interesting thing about this song is that it makes you proud to be from the south if you actually are and the images make those not from the south feel like heading there for a visit. The southern charm, the sweet tea, and the girls that appreciate a country gentleman. The South must be quite the place of good times, laughter, and good company. This tune gets a little campy. The picking at the beginning of the song might throw you off for a second. The chorus for Love Will Do That is good and it makes the song good enough for the album. The song is more upbeat goodness from Darius, but at this point on the album it can wear a little thin depending on the mood you’re in. It’s a good track, but not the best on the album. It’s about all the ways love will make you act strange and be a little crazy. It’s true, but nothing special on this one. This song is about a girl that does tons of crazy things in her life. She’s been everywhere and done just about anything. Walk on fire? Check. Jump out of planes? Check. Even with all of that the craziest thing she’s ever done – loving her man. Settling down and having a few kids with the person you love the most might not seem like the craziest thing a person could do but there are tons of crazy things that can happen. It’s hard not to think this song is about Darius and his wife. Perhaps his wife is the one that was a little crazy during her life but settled down with the rock star turned country star and that’s the craziest things he’s ever done. Darius slows things down again on the eighth track. The song is aptly titled Things I’d Never Do. Darius starts by listing those exact things he’d never do. Then the chorus kicks in and we find the narrator in a hotel room thinking about all the things he wished he could change. We all have plans to never do the things that cause others pain and sorrow, but some of us just can’t help falling into the traps of wrong decisions. This song is a definite tear in your beer song and one that could become a hit on radio. There is a lot of emotion and pain in the vocal. The production is solid and fits right in with most country music today and it’s another solid track from Darius. More slow, sadness hear on this track. There appears to be some self reflection going on with this track for Darius. This one could perhaps be the darkest song on the album and that’s a bit of surprise from Darius who normally remains so upbeat about life and his family. The song is fairly vague about what is actually making for the sad situation, but the opening lyrics reveal a man wondering if he’s working too much while missing his kids growing up. A telling sign of a little regret for Darius despite his thoughts in the first track on the album? What a great duet. Darius Rucker and Brad Paisley. Two of today’s best country artists. I love – I mean absolutely love – the topic of this song. Sometimes you can’t take things to seriously in life. Don’t worry about the correct thing to do. Just do what you love and do the things you want. There is room in life for some non-planned situations and sneaking a few extra peeks at women in tight clothes. I love this song and if you don’t well…I don’t care. Darius is singing about his wife again on this track. It’s a great song about a woman. The melody is beautiful and heart warming. The song is full of emotion and great lyrics. The devotion between Darius and his wife is evident throughout this album, but this track is a definite anthem for her. Love has been the fuel for some great country songs over the years and this one sure sounds like a single that would work well over the Valentine’s Day holiday this spring. This is the breakup song on the album. The narrator is realizing he’s got nothing to say even though his woman is leaving him. He covers the emotions some feel when there is nothing left to say when you both know it’s over. Even if there is still some feeling that you want to be with them you both kind of no there is nothing you can do. Maybe it’s best to actually have nothing to say. The closing track on the album gets things finished up in…well…a big way. Maybe it’s not a big way, but it’s a good song that is trademark Darius. By this point we’ve had two albums of country Darius and there is no doubt he’s full of upbeat stories of life and love. The song is about enjoying the country music life and having fun with the ones you love. This song puts a smile on your face and makes you happy to have listened to the album. What a great way to close out a great album from a true country superstar.